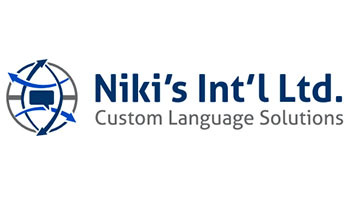 Niki’s Int’l Ltd. is a fast-growing, woman and minority-owned Language Service Provider based in Charlotte, NC. We are a nationwide provider of interpretation and translation services for various industries including business, legal, healthcare, and insurance – additionally, we provide a variety of transportation services specifically for the workers’ compensation insurance segment. With 20 years of experience in the language and logistics industry, we offer an array of services to meet client needs throughout the United States & abroad, 24/7. • Aggressively pursuing potential vendors in the US market by leveraging leads, prior contacts and industry knowledge while providing accurate information about Niki’s Int’l Ltd. company history, policies and professional practices. • Maintains the high standard of customer service with clients, vendors and co-workers, meeting the mission and vision of Niki’s Int’l Ltd.
• Self-driven, dedicated, patient, with a positive outlook and clear focus on deadlines and customer service. • Possesses excellent communication skills, pays attention to detail and comfortable working in a heavy teamwork environment. • Reports to the Vendor Contracting Department Manager or Operations Manager in lieu. • Executes the company’s mission and vision with each potential client. • Collaborates with other Niki’s Int’l Ltd. employees to maximize business opportunities for the company. • Plans work day to meet, call and interact with potential vendors on a daily basis. • Reports these metrics weekly, i.e. Completed Vendor Requests and New Vendor Postings. Reports these metrics monthly, i.e. Completed Calls, Completed Interviews and Completed Contracts. • Progress tracking of vendors. • Insurance review for transport vendors. • Identifies new ways to improve services and shares with the company’s executive team. • Receives and reviews on-line vendor applications, eliminating ineligible candidates. • Contacts on-line applicants whose skillsets match needed areas for vendors. • Sources new vendors throughout the US using LinkedIn, Indeed, vendor trade associations, personal network and additional resources. • Responds to general inquiries via telephone and e-mail from vendors about contract updates, new contracts and application process/progress. • Take all inbound calls for the vendor contracting department. • Evaluates candidates according to Niki’s Int’l Ltd. standards and tracks candidates’ progress throughout contracting process. • Offers contracts to eligible applicants that meet all Niki’s Int’l Ltd. criteria upon completion of contracting process. • Enters all new contracted vendors into the SARA database for scheduling and accounting access. • Maintains accurate, updated contact information for all resources in the SARA database. • Maintains updated COIs on file for all transportation providers and tracks expiration dates to request new copies. • Takes requests from scheduling department to locate and contract new or additional vendors for specific assignments. • Constant communication with clients and teamwork with co-workers to meet client needs. • Ensures that prospective vendors receive a response to any communication within 24 hours. • Manages prospective vendors’ expectations on working with Niki’s Int’l Ltd.
• Communicates with prospective vendors through phone, internet, fax, emails or other means. • Is a good steward of Niki’s Int’l Ltd. financial resources. • Contracts vendors within required rate ranges to ensure positive margins for assignments. • Promotes the organization to regional, national and international, prospective clients. • Builds a business network using personal contacts, email, direct mail and social networking. • Attends company functions, meetings and conferences as required. • Other duties as required to facilitate a team environment within the organization. • Contributes to a positive company culture by adhering to the corporate values in every interaction, every time including integrity, transparency, efficiency, accuracy, teamwork and quality. • Highest ethics and integrity when representing Niki’s Int’l Ltd. required. • 2+ years of services, staffing, human resources and/or consulting recruiting experience preferred. • Bachelor’s degree in communication, business or international business or related field. • Skilled in creating and fostering excellent client relationships. • Ability to work in a fast-paced, guaranteed customer service environment. • Professionalism, patience and the ability to multi-task. • Excellent time management, organization and prioritization skills. • Self-motivated and has the ability to work under minimal supervision. • Proficiency in MS Word, MS Excel and Google applications required. • Ability to communicate and work with clients and vendors. • Knowledge of language, translation and interpretation offerings from various competing vendors.